Throughout the week we’ve been using the power of science to pair together two ingredients which at first may sound unusual when combined, but are in fact delicious together. Today’s flavor combo is pineapple and blue cheese. Shake it over ice and strain it into a cocktail goblet. 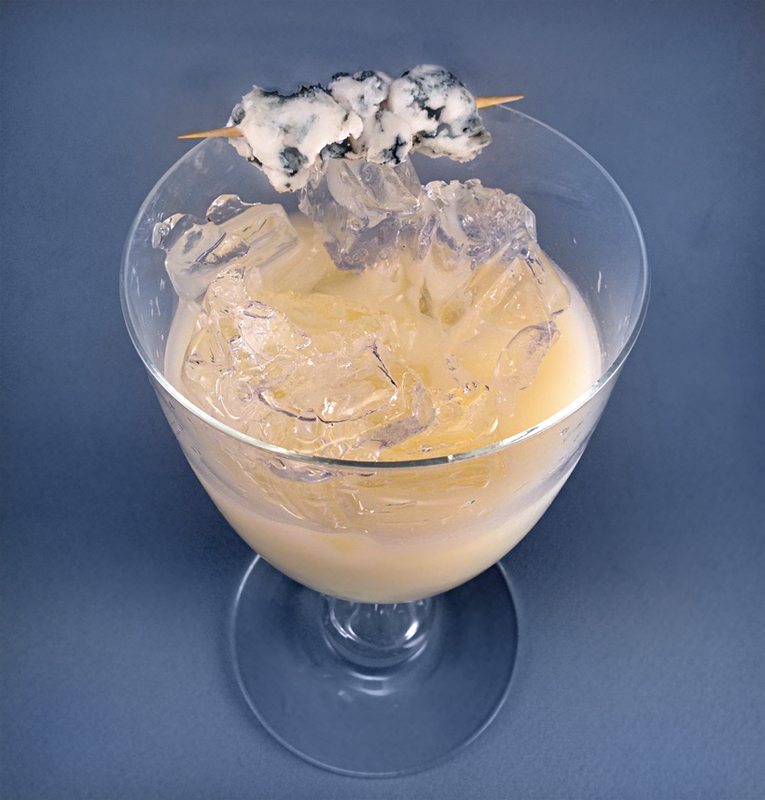 Garnish the drink with skewered blue cheese. OK so admittedly the blue cheese is the garnish, but this drink simply would not be the same without it. Besides, c’mon. Drinking blue cheese is just nasty. Trust us, we tried it. The amazing thing about this drink is that it comes as a two part experience. The garnish plays a crucial role as you discover while raising the glass to sip the drink, and your nose is filled with the aroma of blue cheese. As you sip, your mouth is greeted by mellowed pineapple, and the two sensations combine to create an intriguing taste, which is the first half of this drink. Blue cheese and pineapple taste great together because they both contain a chemical called methyl hexanoate, which we detect using our mouth and nose, and which you would describe as “fruitiness”, “sweetness”, and “freshness”. Of course, blue cheese also has its own funk, but strangely, it fits in with the other flavors nicely. 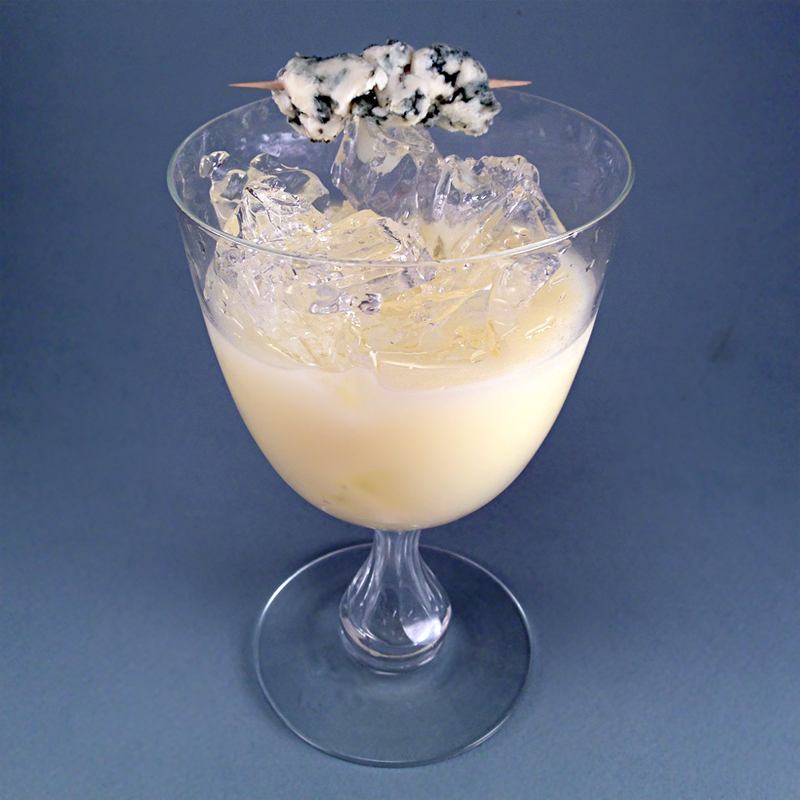 The kefir gives the drink a slightly higher-than-usual viscosity, and is slightly sour itself, which perhaps creates an artificial sensation of blue cheese in your mouth. The second half is experienced as you set the glass down and swallow the drink. The absence of the blue cheese’s aroma allows room for your palate to appreciate the tangy yet sweet mellowness of the kefir and the pineapple. Gin always pairs nicely with pineapple. Cocchi Americano lends the drink its dryness, and its notes of gentian and cinchona give this mellow drink a slightly bitter edge. It is worth noting that white wine also contains methyl hexanoate, which is why we chose to use a white aperitif wine. Mainly you’ll be astonished by how different the drink is without the aroma of blue cheese. Categories: modern drinks, original creations | Tags: alcohol, bartending, blue cheese, booze, cocchi americano, cocktail, cocktails, craft cocktails, drinking, drinks, gin, kefir, liquor, mixed drinks, mixology, molecular mixology, pineapple, pineapple juice | Permalink. Wow, Sir! You just leveled up! The Kefir is the most intriguing aspect of this drink for me; I’d always known it to be a lime before my just-passed googling. If you made it yourself, I’d be bowing. I’m hoping next month’s olfactory homework will give me a deeper understanding of the smell/taste connection and its effects on flavor sensations. Any suggested readings/experiments? You know, last night Joe and I tried mixing another drink with kefir, and it was just nasty. A total failure. Super sour and it can curdle quite easily. We didn’t realize it at the time, but we got lucky with the kefir in this drink. We’re busy trying to put together some more awesome kefir drinks, though! So we’ll keep you posted. I’m wondering what the chemicals might be in the kefir, and how dependent the type of animal it is source from is (apparently it can be one of many). Maybe the stuff is better composed for pineapple in much the same way as the bleu cheese? I’ve never had kefir, but it sounds like it would be sour/cheesy, so maybe pineapple was just a natural neutralizer/enhancer? I don’t know, that’s all just speculation. On with the science! I have also been blending up pineapple/berry/kefir smoothies lately, and I think it is very much the case that kefir + pineapple have a great synergy. Some other flavors that I know work well with kefir, from experience: mango, mint, rose, honey, chai spices, raisins. So, pretty much anything you’d find in an Indian dish?